The High Low Logic Index was developed by Norman Fosback. It is calculated as the lesser of the number of new highs or new lows divided by the total number of issues traded. Daily or weekly NYSE data is typically used in the calculation. The concept behind the indicator is that either a large number of stocks will establish new highs or a large number of stocks will establish new lows, but normally not both at the same time. 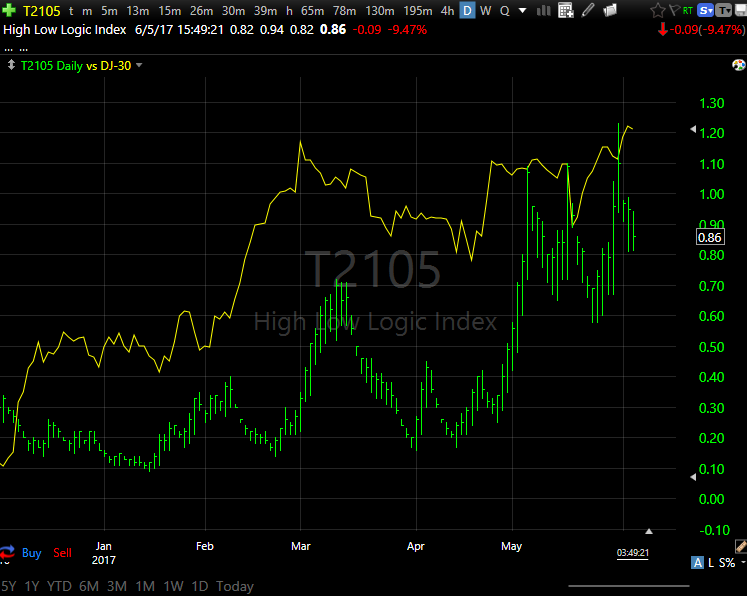 Since the High Low Logic Index is the lesser of the two ration, high readings are infrequent. When a high indicator reading does occur, it signifies that market internals are inconsistent with many stocks establishing new highs at the same time that many stocks establish new lows. When this happens, it is considers bearish for stock prices. Extreme low indicator readings reveal a uniform market. They are considered bullish for stock prices.